[Episcopal News Service] The Rev. Michael Buerkel Hunn, canon to Presiding Bishop Michael Curry for ministry within the Episcopal Church, was elected May 5 to become the next bishop of the Diocese of the Rio Grande at the Cathedral of St. John, Albuquerque, New Mexico. The slate of three candidates included Hunn; the Rev. Lucinda Ashby, canon to the ordinary for the Diocese of Idaho; and the Rev. Simon Charles Justice, rector of Church of the Good Samaritan, Corvallis, Oregon. Hunn was elected on the third ballot. The diocesan constitution and canons require a majority, determined by the total number of those eligible to vote, in the lay and clergy orders on the same ballot. Of the total (103) eligible canonically resident clergy, 52 represented a quorum and were required for an election. Of the total (204) eligible lay delegates, 103 represented a quorum and were required for an election. Hunn received 55 clergy votes and 141 lay votes. After the bishop-elect receives the canonically required consent of a majority of the Episcopal Church’s diocesan standing committees and bishops with jurisdiction, Curry will ordain and consecrate the new bishop Nov. 3 in Albuquerque. The Diocese of the Rio Grande encompasses 154,000 square miles, including the state of New Mexico and far West Texas from the Pecos River to the border with Mexico along the Rio Grande River, and has 63 congregations with 15,000 members. Hunn said that he and his wife, the Rev. Meg Buerkel Hunn, assistant rector at Christ Church in Raleigh, North Carolina, “are eager to begin making a home among you in a few short months.” The Buerkel Hunns have three children, Dexter, Murphy, and Dosie. The bishop-elect grew up in New Mexico and Texas. In 20 years of ordained ministry, he has served as a parish priest, school chaplain, college chaplain and canon to Curry when the latter was bishop of the Diocese North Carolina. In his current job, he supports the presiding bishop’s ministry, serves as director of communications and oversees other key departments. He led the transition team as Curry became presiding bishop and led a staff-wide restructure and culture-transformation process, according to his biography on the Rio Grande website. 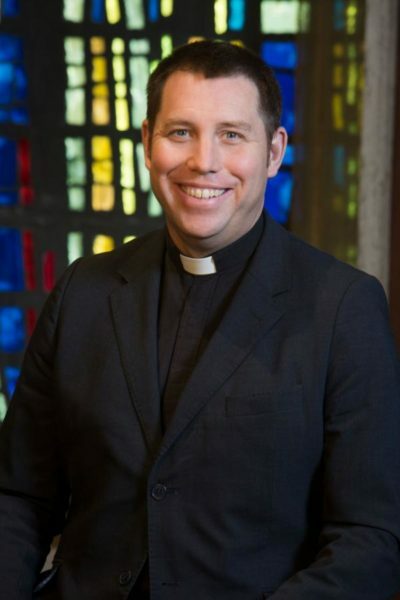 While he was a canon to the ordinary in North Carolina, he designed and led diocesan systems in the areas of congregational support and development, youth ministry, pastoral response, transition ministry, clergy discipline, misconduct prevention training, priestly ordination process and conflict transformation. Hunn is also a lecturer, keynote speaker and preacher on subjects such as public speaking, nonviolent communication, canon law, stewardship and nonviolent approaches to conversations about race. Ordained in 1996, Hunn first served The Kent School in Connecticut as chaplain, head baseball coach and chair of the theology department. He went on to serve as senior associate rector of the Church of the Holy Comforter in Kenilworth, Illinois, and as Episcopal chaplain to Davidson College and associate rector of St. Alban’s, Davidson, North Carolina. He holds degrees from Middlebury College (Bachelor of Arts in history and religion) and Cambridge University (Master of Arts in theology) and a Certificate of Advanced Theological Study from Seabury-Western Theological Seminary.